Athletic Coed – for our more serious players who love the thrill of victory and loath the taste of defeat! Games are a little more intense and teams more organized. These leagues are designed for players that have significant experience with the sport. We allow individuals, small groups and teams to all join our leagues. DC Fray reserves the right to add additional players to ANY team that is under the official roster size for the league. During registration captains can pick up free agents or mark their group as ready to merge via commish. After registration closes DC Fray goes through and finalizes rosters by placing free agents, merging groups and deleting unpaid players. Being a promoted team does not mean you may not receive additional players. Teams who want to “lock” their roster may prepay for a team at the official roster size. Example, softball is 15 players officially but your team only wants 12 players. You can purchase a team spot for a roster of 15 and only fill your desired number but those additional spots are technically used and are not refundable. DC Fray is proud to relieve captains of the burden of paying for full teams. While captains and players are able to prepay for additional players and or full teams, it is not a requirement for participation in our leagues. We welcome individual player payments. We are also proud to welcome those who do not have a full team (small groups and free agents) to participate in our league.Our primary mission is to make it easier for people to have fun and get involved with social sports and these policies help accomplish that goal. Because of these policies, all registrations are on a first come first serve basis and any roster that does not reach our standard size (based on each sport) is eligible to receive free agents and or small group by the league. Rosters made up of primarily free agents and or a collection of small groups may field more players than the standard roster size. This policy is in place to help ensure free agent teams are able to consistently field teams each week. 1. Ten (10) players (at least 3 females) in the field at all time. A. THERE ARE NO POSITION REQUIREMENTS of any players, i.e. there need not be 2 females in outfield and 2 in the infield) DC Fray rules will allow a team to play with a minimum of seven (7) players (at least 2 females). 4. If playing with eight (8) players, no more than six (6) men are allowed on the field at on time. 5. If playing with nine (9) or more players, no more than seven (7) men are allowed on the field at one time. A “strike mat” will be used to determine sure strikes, if the softball touches any part of the mat OR home plate on a legal pitch (6’-12’ arc), it will be considered a strike. All batters will start with a one ball, one strike count. 1. If a male is walked on three (3) straight balls with two (2) outs on the board, and a female follows him in the batting order, the female has the choice to take a walk or bat. The umpire will enforce this rule upon request; however, they will not be responsible for notifying the batter in each walk situation. The umpire must be made aware that a female is on deck before the 2nd pitch is thrown. 3. All games are seven (7) innings or one (1) hour; the last inning will start 10 – 15 minutes to the hour. The umpire will enforce this rule and will make the call at the top of the final inning. 4. Due to differing circumstances in each and every game, some games will finish short on an hour in length, while others might run over the hour mark. Please respect your umpire call in this matter. He/she must keep all games on time in fairness to teams playing later hours and due to facility permit restrictions. 5. Teams may bat more than ten (10) players. Prior to regular season games, teams must request lineups sheet in order to raise lineup objects during the game. For tournaments, the umpire will require a line sheet. Forfeit rule: 10 minutes after game time. If one team has less than the minimum number of players (7 total – 2 females) at ten past the designated start time, the game will be deemed a forfeit. 1. DC Fray will provide all bases and balls for each game. Gloves are not guaranteed to be supplied and players must bring their own. It is also recommended that teams bring their own bats though at least one approved bat will be provided. (In Leagues that are marked as Wooden Bat Only the League will provide such bat! E. If the ball is overthrown and hits the fence behind the 1st or 3rd base lines, this is NOT considered out of play and the runner may advance, BUT at his/her own risk. F. On overthrows out of play, the runner is granted the base he/she is going to (at the point of the throw) plus one more. Note: in cases where a base runner runs past first base, he/she must make a clearly aggressive turn towards second base to be granted 2nd and 3rd in overthrow situations. 2. Batting order must consist of a 2-1 ratio. (For every 2 male batters in a row a female batter must be next, ie. every third batter must be a female. A. Females can bat multiple times in the lineup to achieve this ratio. If females are batting more than once in a lineup their rotation must stay in order. All females must evenly rotate through the female batting positions. B. In order to ensure all players are able to bat females may “double up” or rotate through the required female slots as described above. 3. Outfield Encroachment Line: Outfielders may not play closer that 150 feet from home plate. This line is to encourage fair play and will be set up by your umpire and marked by cones down the foul lines and/or across the field. 4. Game mercy rule: 12 runs up after five complete innings – losing teams option. 5. Inning run limit rule: There will be a five (5) run limit per inning for innings 1-4. (Exception: unlimited runs may be scored if one of the innings 1-4 is declared the final inning of the game.) Unlimited runs may be scored in innings 5, 6, and 7 always. 7. On an infield fly (any fly ball within the infield with significant arc and deemed an “easy catch”) with less than 2 outs and runners on 1st and 2nd or 1st, 2nd and 3rd, the batter is automatically out and runners can advance, BUT at their own risk. 8. Base runner to defensive player contact will be closely watched by the ump. B. For plays between 3rd and home, there is no contact allowed. When a runner passes the “commit line” (the halfway point between third and home which will be at the discretion of the ump), they can be called out at home if the defense gets the ball to the ”safety home plate” first. If the runner retreats to 3rd, and the defense gets the ball to 3rd before the runner, then they are also out on the force. i. The catcher or any defensive player playing as catcher must play the ball on the Defensive home plate which is located about 5 feet in front of the normal plate. When the catch is made and the player is in this position the umpire will consider this moment as contact with the player or base. ii. Any runners coming home must cross the Offensive home plate (where you hit from) before this mark is reached by the defensive player. If contact is made the player will be declared safe automatically. iii. Additionally, any runner that touches the Defensive home plate rather than the Offensive one will automatically be called out. C. All plays between home plate and first base are force plays. There is no contact allowed on these plays. If contact is made with the runner, the runner will be ruled safe. If a runner “rounds” first and heads for second the runner can be tagged out. D. The strike mat is an extension of home plate and must be used by the runner for any slides / home plate crossings for safety purposes. 9. All batting count starts at 1-1 (One ball, one strike). A Pitch has to have a slow pitch arch at least 6 ft. and no higher than 12ft off the ground at its highest point to be considered a legal pitch. 1. If a rainout occurs while a game is in progress, three (3) innings must be completed for the game to count. The umpire clock is the game clock and will inform both teams when the game has started. 2. Games ending before the three (3) innings have concluded will be rescheduled and played as a new game. G. All other rules follow standard slow pitch ASA guidelines. How much does it cost to join a DC Softball league? Registration dues vary by location and night. DC Softball strives to keep dues low while still providing a quality experience for our members. Most leagues range in cost from $45 – $69. This fee covers insurance, court costs , equipment, player t-shirts, parties, prizes, recruiting, and the tons of other DC Fray events that we will be hosting throughout the year. You definitely get your money’s worth! Each league gets at least 6 organized nights of games, playoffs (if applicable), league shirts, and league-wide parties where you’ll get to meet literally hundreds and hundreds of other players. You’ll also have access to all our other non-softball related events, shindigs and parties throughout the year. Please note, DC Fray does not issue refunds. 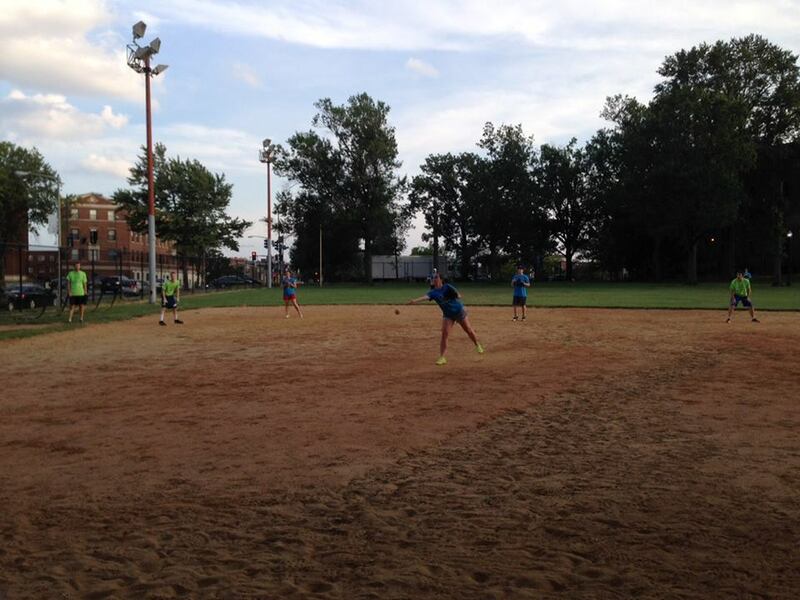 ← How much does it cost to join a DC Softball league? We are first and foremost a SOCIAL company. We are starting to offer different competitive levels for softball. Each level from social,gender specific and athletic. Please read your season info page to see if the league is at a different level. What’s a DC Softball game night like? ← What’s a DC Softball game night like? Yes, for coed leagues there must be at least 3 females on the field and in the batting order at all times. We recommend 4-5 on the roster. At DC Fray we’re on a mission to make fun possible. Through social sports leagues and special events, we help you connect with friends, making new ones and play more often. All of our leagues, policies & rules are built to support the #FrayLife mission! Overall our rule of thumb is social first. Did someone say happy hour? There’s no skill requirement - new to the sport? Great! Former MLB Player? Perfect! Everyone is welcome. Teams are required to have at least 12 players on their rosters. We welcome free agents and small groups and will do our best to match players to teams. Games begin April 2nd and run weekly from 7PM-10PM. After each game we hit the sponsor bar for a party like no other. Get ready for drink specials, flip cup,and an end of season party (yep, that includes free beer). We'll bring the classic DC Fray touch with prize giveaways, beer giveaways, sweet t-shirts, new friends and more.